The following is a blog written by Type 1: Perfectionist about his wife, Type 7: Enthusiast. People don’t often associate Type 1s with having a great sense of humor. Yet, this man is an award-winning copywriter and has been in the ad business for more years than he wishes to count. He and his wife are both in their mid-70s. You can see Type 1 fully in his telling of the following tale. Backing Up Is Hard To Do. My wife has a thorny problem with relations. The spatial ones. When she’s backing up a car, you never stand near it. Because wherever you’re standing, you’re in mortal danger. In the past few years, backing out of our garage, she has collided with four cars parked in our driveway and one innocently parked across from our house on the other side of the street. It’s as if she were backing up an articulated big-rig vehicle. To go left, you turn the steering wheel right, right? My wife does this in our Honda CRV. In all of these accidents, we have been very fortunate that all she hit was metal. Metal can be repaired or replaced. I shudder to think of what else she could have hit. Like children or animals. Her lack of spatial-relation skills may be hereditary. Because her sister just backed through a closed garage door. I can picture the medical profession recognizing this as a unique genetic condition: the “backing lacking syndrome.” But maybe it’s not hereditary. I mean, these accidents do require a willful disregard of the obvious. So to be more empathetic – to see it from her point of view – I mentally reproduce the scene. I open the kitchen door leading to the garage. I press the remotely operated garage door. I walk towards the street between our two garaged cars. Now I am outside the garage, facing the other car or cars hypothetically parked in the driveway. Next I turn and go to the left side of the CRV, open the driver’s door and get in. Obvious conclusion: My wife had to see any car parked in the driveway. And then in the next second forget about it (please don’t tell me it’s Alzheimer’s!) and swerve, backing into it! This could be the first case of Spatial Confusion complicated by Alzheimer’s? What will doctors call it? Dyslexic Dementia? Today’s post was originally published on the Lead Change Group blog in 2012. A recent Forbes article: 31 Telltale Signs You Are A Horrible Boss got me thinking and it inspired this post. Many of us will recognize our former or present bosses described there and, worse yet, we may recognize ourselves! I began to wonder what happens to someone when they become a boss? Which led to … do we need to have bosses? What practical function do they provide and do the negatives outweigh the benefits? Perhaps the problem is embedded in the word and we need to banish “boss” from our business vocabulary? The language we use has a profound impact on how we see and experience reality. If you become a mom, dad, grandparent, policeman or policewoman and you step into that skin and/or uniform, you take on a role. That role is informed by your perception of what it means to be a mom. How you have experienced others in that role, and even wearing the uniform shifts your sense of self and effects how you play your role. Recently, my friend Joan asked a friend of hers to become godfather to her son Daniel. She described a big shift in his behavior. He stepped up and took on the responsibility and the role. His subsequent relationship to my friend and her son changed noticeably. When someone takes on the moniker “boss” he begins to embody his perception and definition of what it means to be a boss and takes on that role as he interprets it. “I am here to boss you around,” could be one interpretation, along with many others. Think about how the word immediately sets up a power dynamic and a parent/child relationship. Boss is synonymous with authority figure and the role presumes that people need to be told what to do, punishments and rewards should be meted out. Remember the Stanford Prison experiment? It was a simulation where the prison guards became sadistic and the prisoners became depressed and showed signs of extreme stress. When people took on the roles they began to do, say, and feel things that were congruent with the roles they were playing. It got so bad, they had to end the experiment after six days. The most valuable things my former bosses did was to share information from above and across the organization; to set the vision and direction; to jointly set my goals and objectives; to advocate for me and my ideas; to make sure I got salary increases and bonuses; to approve vacation dates. My former bosses also held me accountable to honor my agreements and commitments, to adhere to the organization’s ethics and standards and to be the best I could be. One of the most unnecessary functions they performed was the annual performance review. By the time I got my review, the information was so stale, it grew mold and had to be tossed. A comprehensive list of destructive boss behaviors can be found in the Forbes article. If the list weren’t so real and tragic, it would be funny. Ideally, bosses are available to advise and give council, to sooth and encourage, to help build confidence, to motivate and inspire. Ideally a boss is someone who is wise and transmits that wisdom to help their direct reports develop, grow and thrive both personally and professionally. If part of the problem is the title Boss / Manager, I continued to wonder, what alternative is there? How about mentor? I love the genesis of the word from the Greek Myth, Odysseus. In Greek mythology, in his old age Mentor was a friend of Odysseus who placed Mentor in charge of his son Telemachus and of Odysseus’ palace, when Odysseus left for the Trojan War. When Athena visited Telemachus she took the disguise of Mentor to hide herself from the suitors of Telemachus’ mother Penelope. Because of Mentor’s relationship with Telemachus, and the disguised Athena’s encouragement and practical plans for dealing with dilemmas, the name Mentor has been adopted in English as a term meaning someone who imparts wisdom to and shares knowledge with a less experienced colleague. Mentor suggests a type of relationship: I am here for you. I am here to help you develop and grow. I trust that you are fully capable of doing your job. I know you will rise to my high expectations of you. I will model the way by my words and behaviors. Come to me when you need advice, counseling, guidance. A mentor sponsors, supports, nurtures and advises. A mentor is a wise and trusted ‘counselor’ who passes on knowledge, experience and wisdom and who opens doors to opportunities that may otherwise be out of reach. However, I do believe that if the title and role was mentor, even someone with autocratic tendencies might start to adopt a different set of behaviors–perhaps with some coaching. Just by the change in title, it sets up a whole other set of expectations with associated behaviors. What kind of organizational and individual changes can you imagine as a result of this? Perhaps you’ve seen this or a similar model implemented? Please comment, engage and share! You can review the nine Enneagram Styles to see the different approaches to leadership and how they might warm to and/or be challenged by the role. Post Script: as this blog was about to go to print, the following article from Wharton Human Resources came to my attention. I love serendipity: Going Boss-free: Utopia or ‘Lord of the Flies’? It addresses some of the experiments around self-managed teams and takes a different but complimentary tack to my post. Small Choices Big Impact originally appeared on Susan Mazza’s blog Random Acts of Leadership around the time my book InsideOut Enneagram: The Game-Changing Guide for Leaders was released. I am grateful to Susan for allowing me to share it here and I believe its timeless message is as relevant today as it was when it was originally published. Every moment of every day, we are making choices. On and on … we make little daily choices. They add up. Over time, these choices become our habits – conscious or unconscious, wanted or unwanted. While they may seem somewhat benign at first, these little choices make up how we live daily. Yet think about it. This is your one precious life. How do you want to create your life? All these little choices add up to the life each of us chooses to create. It is the “drip, drip” of the water that over time carves out a rut that keeps us stuck, or a flow that carries us forward. These aren’t just habits that we have at home. I am talking about the whole YOU. Meaning, your private and public self; the way you are with your family, friends AND the way you LEAD. There is no separation, much as we’d like to think so. Some of these choices create the pile of dirt and dust under the carpet that we ultimately trip over, and end up hurting ourselves, and often others. These little habits become our patterns of living and interacting. They affect our mental, physical, spiritual health and wellbeing. …If I decide upon waking to meditate and this becomes a habit, my spiritual, emotional and mental wellbeing can be enhanced dramatically. …If I choose to build exercise into my day, my overall health will improve. …If I choose to support rather than criticize, my interactions with people will become more joyful and loving and they in turn, will benefit. I will feel better about myself too! When faced with BIG CHOICES–the forks in the road that determine the course of our life–our little choices feed into the forks we ultimately choose. These choices determine the course and direction for our life. Yet, many of us are sleepwalking down the road. These BIG CHOICES take us on a path and on an adventure to an unknown destination. Should I go to university? Drop out of school? Marry X? Have children? Take X job? Leave X job? Follow my dream? Buy that house? Move to X? What are the little habits that feed how we make these big decisions and which path we choose? Then there are these seemingly small, yet BIG CHOICES – the ones we make between staying true to our core beliefs and ethics or not. Unfortunately, once we violate our own ethics, it becomes easier and easier to cross that line again, until we rationalize it as OK, “everybody else is doing it …” Suddenly we are on a path, perhaps to our own self-destruction and to hurting countless others. The GOOD NEWS is that we can course-correct. The locus of control is within us. We can either choose to create our lives consciously, with vision, purpose and intent, or be carried away by invisible currents to a destiny not of our conscious choosing. I have found the Enneagram to be a useful shortcut to self-awareness, because it helps bring many of these unconscious habits and patterns to light. It gets to why we think, feel and act in patterned ways and to our beliefs about ourselves and the world that undergird our choices. If you want to peel back the curtain on your life and begin to consciously choose the path you are walking, the Enneagram is a great way to do that. I can say that the insights have been breathtaking and life changing for me personally and I have witnessed this for countless others. With awareness, you choose: Where do you want to place your focus, time, attention and energy? Your day can be like a meditation. Observe your thoughts and choices. Don’t judge. Watch. Now what? Choose wisely. Move toward creating the life you desire. Ask yourself, “what will get me closer to the results I want? This is your one precious life, what do you choose to create? Today I’m pleased to share a guest post from Dr. Roxanne Howe-Murphy of Deep Living Institute. While it’s not something talked openly about in “polite” conversation, there’s one thing that everyone in the world has in common—the inner critic. It is found in every hard-held opinion and judgment, in every comparison, in the loud inner voice or the nearly inaudible buzz that fills up our inner space. When you feel stuck or find yourself procrastinating on something really important, the Inner Critic is active. It’s also at the core of many interpersonal conflicts and unresolved racial, ethnic and religious/secular relations. There is no question, the way we experience ourselves is intimately related to the amount of internal space we give to the inner critic! Whether you work hard to bolster your sense of worth, or carry a certain resignation that simply being enough will forever evade you, you know the Inner Critic is active. It can’t help but affect your relationship to yourself and to others, to the decisions that shape your life, how you do life, and how you lead. Left to operate on its own, it exacts a heavy price that’s ultimately paid by a scarred and deadened soul. With such profound consequences, our Inner Critic presents perhaps some of our most significant opportunities to open our eyes to the truth of who we really are. Here’s the kicker, while it can show up under any and all circumstances in life, the Inner Critic becomes particularly activated and accelerated when an individual is on the path of real change and growth. If you ask, “What can I do to make a positive difference in my own life and in my interactions with others?” one of the most tangible and potent places to focus your energy is in changing your relationship to the Inner Critic. You can begin by learning to decrease the amount of power you give to it. As you do so, you make room for your more authentic inner guidance and authority. Not surprisingly, the Enneagram offers enormous insight into the Inner Critic and its relationship to the experience of inner authority that is possible for each Type. When your relationship to the Inner Critic shifts, you have more energy and momentum for your life purpose and more room for what your soul and heart are destined to express. On Wednesday, Jan 23, I’m presenting a two-hour tele-conference workshop, From Inner Critic to Inner Authority: Healing Your Relationship to the Inner Critic Shifts Your Relationship to Yourself based on a chapter from my new book, Deep Living: Transforming Your Relationship to Everything That Matters Through the Enneagram. The teleconference is hosted by Enneagram expert, Wendy Appel. Click here to register. Dr. Roxanne Howe-Murphy is a pioneer and global leader integrating the Enneagram and coaching. She founded the Deep Coaching Institute, a leading Enneagram coaching school that serves an international student body, and the Deep Living Institute for spiritual and life practice. She is the author of Deep Coaching: Using the Enneagram as a Catalyst for Profound Change, which has provided guidance to thousands of coaches around the world. For information on Roxanne’s work, go to www.deeplivinginstitute.com. Today I’m pleased to share a guest post written by Liz Williams of Collaboration Zone. Protecting myself from energy drain by apportioning my time and choosing my focus. Believing that no one will support me. If I squint my eyes and look sideways, just so, I can make those words fit. But there’s another that brings coherence to these other words: Transcendence. I’m always looking for a way to make an enterprise get up and dance, to find the third rail that plugs right into the source. That’s why I’m so bloody impossible sometimes. It’s why you want me, an Enneagram Type 5, on your team. When the pressure to turn “I” and “we” into “I” versus “we” escalates, I won’t. Why settle for choosing one over the other when committing to both “I” and “we” transcends the limits of either? This is why you want some 5 on your team. I strengthen the “we” by walking the path of “I” and inviting others to join me. Wildly divergent views don’t bother me. I’m unlikely to settle for “living with it” when I can see a way for us to be fully committed without cutting off anyone. Groupthink is repugnant to me. But, if you want to walk out of the room knowing you’ve just made magic together, you might want a little 5 in the mix. I’ll see things differently and say so. I’ll see connections between wildly different viewpoints. I’ll ignore details you think important in favor of the picture forming – and reforming – in my head. I can get the team all the way to a real yes. Is there a downside? You betcha. I’m the person most likely to be doodling when you think I should be giving my full attention to the speaker or task at hand. (The accompanying doodle is what I did when I was “supposed” to be writing this article.) I won’t think to tell you about a recent study linking doodling with a 29% increase in retention. I’m full of these irritating little factoids and practices, always geeking out about something. A room full of 5s is likely to yield pristine, beautiful, and perfect ideas that need just a little more tweaking before their utter genius lights up the world. If you don’t shove the occasional pizza under the door, we can waste away in there. A deadline – a real deadline – is critical. Insisting on shopping the idea around is enormously irritating to us 5s, and enormously helpful, especially if we are free to ignore the feedback (we won’t). As much as we’d like to outdo Einstein and turn everything into a breakthrough that transforms the world, planning the company Christmas party probably doesn’t warrant that level of attention. Please stop us. But when the situation is complex or thorny and can only be solved by refusing to choose for “I” versus “we?” Get some 5 on it. Liz Williams owns Collaboration Zone, a consultancy that helps people do their best work ever and enjoy each other in the process. She blogs about collaboration, works with clients primarily in healthcare, teaches at Alliant University in the California School of Professional Psychology, and doodles. Today, I’m pleased to share a guest post written by Margy Stoner. Margy works part-time for Weaving Influence and part-time for her brother’s consumer electronics company, JacobsParts Inc. She enjoys collecting wild herbs, writing poetry, drinking vegetable juice, and hiking with her dog Tesla. When I was a junior in high school, I took a class called “Relationships.” My friends and I assumed this would be an “easy-A” class about treating others well, serving the less privileged, and other principles that were repeatedly stressed in our Jesuit Education. Little did I know, however, that much of the study of “relationships” deals with our relationships with ourselves. It was in this class where I was first introduced to the Enneagram. We were given a self-assessment, which asked us various questions to help us determine our types. Then, the teacher told us that no matter what the assessment said, it’s ultimately up to each person to determine his or her type. For a few weeks, my friends and I discussed our types, but once the class ended, I forgot about the Enneagram for a while. Fast forward a few years. I am studying abroad in Jerusalem. I’m spending the Sabbath at a friends apartment—a few of us are eating chips and playing guitar late into the night. Somehow, the Enneagram comes up. For the next few days, my friends and I excitedly take a variety of personality tests. The Enneagram, of course, but also the Belbin test, Meyers-Briggs, and others. We laugh about our “compatibility” with our friends and family, and dream about how our test results can help us become rich—become scholars—become the kind of people that overcome their own flaws and rise above everything they though they could be. And though it was fun learning so much about our compatibility with others, I think that what intrigued us so much about those tests is something quite universal: the desire to know ourselves. Yes, we spend every moment of our lives with ourselves. We live inside our bodies, our heads. And yet, so much time is spent interacting with the external world to the extent that sometimes, we forget who we are. We become blind to our strengths and our weaknesses, we measure ourselves against those around us. Understanding our personalities from a (somewhat) objective perspective allows us, in effect, to step outside of ourselves, to recognize, without judgment, the patterns by which we live our lives. This, I believe, is the power of The Enneagram, or for that manner, any person or tool that helps us to better understand ourselves. Two of the friends I was with that night in Jerusalem, Nomi and Ilan, are now married. I visited them last year and found, on their coffee table, a book about The Enneagram. Nomi is Israeli—she has lived in Jerusalem her whole life. Ilan is from Chicago—he moved to Israel when he was 24 years old. Though they certainly connect on many levels, “we struggled with some cultural differences,” Nomi explained, “but reading about the Enneagram really helped!” Ilan agreed. “It helped us see our differences in a less personal way…and helped us bond spiritually too,” he said. I often hear people say “I don’t want to be labeled,” or “I refuse to put myself in a category.” I understand this sentiment—no one wants to be told that they are just this or just that. But I don’t think assessing yourself has to be limiting. In fact, I think that for any of us to undergo real change, perhaps the greatest struggle in this life, we must recognize our strengths and flaws, and we must be gentle and patient with ourselves. It’s been seven years since I sat down in that high school class, thinking I knew everything I needed to about relationships. Obviously, I didn’t. In fact, I feel like I know a lot less now than I did then. Now, when I struggle to relate to someone else, I try to look at myself—at my reactions to others, and to determine what tangible steps can be taken to remedy the situation. Sometimes this is really hard, because so often I don’t really want to look at myself, to see my actions for what they really are. What helps you get to know yourself? How does knowing yourself help you to better relate to others? When did we stop jumping in the leaf pile, poking holes in tar bubbles, splashing in puddles or letting ourselves muck about in the mud and not worry about getting dirty? When did we stop believing in the magic of life? Did we decide that was just for kids?A wise person once told me that we need to distinguish between our childlike nature and our childish nature. What’s the difference? To be childlike is to connect to our sense of wonder, curiosity, play, spontaneity and our ability to pick ourselves up when we fall and try again and again until we learn to walk. As Adults, we learn to create our lives; to take responsibility for what we say and do and we don’t blame others for how things turned out or as an excuse for our situation. We dust ourselves off, pick ourselves up and put one foot in front of the other. We don’t close down our hearts but make them available to ourselves and others. Everyone gets hurt. Everyone fails. Everyone has a story. It is part of the human condition. As Adults, we measure our words and actions armed with the knowledge that what we say and do has an impact (intended and unintended) on others. And we screw up even with the best of intentions. When there are unintended, harmful consequences, we clean up our mess–make things right, apologize and learn. Adults know the joy of giving-without expecting anything in return. Our source of inspiration, creativity and innovation arises from a childlike state of openness; to what is, to what isn’t and to what may emerge. I just finished reading an OpEd by Jane Mendelsohn in the New York Times about our never-ending fascination with Amelia Earhart. Why? Other than a desire to resolve the mystery of her death, she has inspired millions. She was a heroine, “a leader, not a passive bystander. She was strong, not a victim. And she was not born into a rich family, as were many other women pilots of her day, but was lifted up by her own accomplishments. In other words, she gives us good shoes to fill,” according to the author. I believe we also are inspired by her curiosity and almost childlike, innocent zeal to do something no woman had done; to follow her heart and her dream. Amelia took responsibility for her dream and acted upon it. “She was flying hopelessly around the world and searching for land, longing for one of those islands of stability some of us keep looking for in our 20s, a braceleted wrist held up to the face, hand shielding our eyes from the harsh sun of adulthood, not realizing that we will have to build that island for ourselves.” Such a beautiful expression of the realization of the significance adulthood. Adults have a profound connection to a childlike sense of joy, wonder, spontaneity and curiosity. Blame and judgment are diminished in the face of childlike qualities. We are open and curious about people and situations. Adults cultivate an ability to see the world through others’ eyes. Even if we don’t agree, we can seek to understand and realize there are many points of view, not just one right way. Adults are open to influence. Adults are willing to examine longstanding beliefs and let go of ones that are no longer relevant and may in fact, be the source suffering. Perhaps the shift the world is waiting for is for us to reclaim our childlike quality AND step into our adulthood? With that, may you allow yourself to leap into a mud puddle, make a snow angel or boldly dare to follow your dream. And you? What connects you to childlike wonder in you? When I left California to move to Europe almost six years ago, there were ongoing reports of killer bees and stinging Argentine ants coming to the Western United States from South America. Happily I moved to Europe before I felt the sting of the invasion. However, I have come to find out that the tiniest of red ants that have been colonizing my stone house in Mallorca, are the very same stinging (I would say biting) ants from Argentina that have made there way over here on boats and planes–whether they hitch hiked intentionally searching for new land or they were brought here as captives unknown to their transporters. They crawl all over me when I sit outside and bite like the dickens, invade my laptop keyboard, sneak underneath my clothes, and swarm the dog dish within minutes after my dog has eaten. They terrorize my dog Bear, and they come streaming down the walls by the thousands from minuscule cracks in the ceiling, wood or walls. This doesn’t happen every year but this year happens to be a bad one. Trouble in paradise. I abhor using any kind of toxics so I try all sorts of things, such as cinnamon, but it is no match for these tenacious creatures. All they do is find a way around it. I try spraying lemon and water on them, vinegar and water, and finally Simple Green. Nothing works. As a last ditch attempt, I make a truce with them and plead that if they just stay out of the bedroom and kitchen, we can try to co-exist. However, they they march on. These ubiquitous insects finally ware me down and I purchase a product called Bio Kill, being a sucker for products that have the words Natural, Organic and Bio in the title. As a precaution, I cover my face in a wet towel while spraying and run out of the room. Hurrah! This works. Until . . . they just find another way in. You see, they have colonized the house–they live in the walls and ceilings. Like a dike, you plug one hole and it springs a leak in another place. I win a few battles but I am losing the war. When I find out that these are the Argentine and therefore, non-native invasive ants that have no natural predators here, I am able to partially rationalize my decision to use Zum! This is the real deal, the no nonsense product that guarantees ants will not return for a year. No more messing around! Armed with Zum and a wet towel over my face, I spray their entry points, hold my breath and run out of the house. A few hours later I return to find dead ants dropping from the walls. It gives me a certain amount of satisfaction. I have mixed emotions as I would like to comfortably cohabit but it does not appear to be an option. Interesting to reflect–under what circumstances are you willing to an make exception and violate your own values? Quite honestly, this still bothers me. After all, values are values. I hold myself to pretty high standards. When is it OK to do something not aligned with one’s values? No easy answers. Back to my story. After some research about these ants, I come to realize that even the famed Zum is only a stop-gap measure. I have to kill the queens. Next–boric acid and water which is a slow, non-toxic to humans and effective. As I read on, my euphoria gives way to the realization that the colony is global and stretches for 1000′s of miles. Surrender. At some point we are going to have to learn to co-exist. What can these ants teach me? After all, they are real survivors, they co-operate and are even welcome in the other ant colonies of different types, take over abandoned nests of other ant species, are extremely strong, tenacious, and when one thing doesn’t work, they try another. 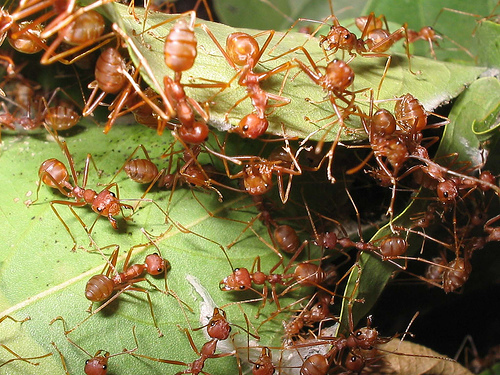 They do fast prototyping–scout ants explore quickly looking for sources of food or for a place where they can set up a nest. As I continue to build my international business, I could use some of what the ants have. Don’t give up, be relentless, find a way, collaborate, learn about and respect the local culture, rapid prototyping . . . all this aggravation has not be for naught. Nature will always be my teacher, even if it is sometimes painful. And you? What does nature teach you? How do you apply these lessons to your business life? Type 8s prefer people to be direct with them—to meet their energy and pace. Indirect communication creates mistrust. They want to know where you stand. They also seem to prefer that this feedback happen in a 1:1 rather than group environment. Recently, I coached Fredric Type 9 Peacemaker, who had a Type 8 CEO boss (Anthony). Fredric was ready to shift the dynamic with his boss. He knew that how he had been dealing with him wasn’t working and Fredric was paying a price. He realized how complacent he became and almost numb. He had no energy and felt overwhelmed by everything and couldn’t seem to take any sustained action. To make matters worse, he asked for a raise and was turned down. Fredric requested a coaching session to help prepare him for his long overdue conversation with Anthony.y to shift the dynamic with his boss. He knew that how he had been dealing with him wasn’t working and Fredric was paying a price. He realized how complacent he became and almost numb. He had no energy and felt overwhelmed by everything and couldn’t seem to take any sustained action. People on the team had been frustrated with Fredric as well—they were walking on eggshells around him because he had become somewhat prickly—seemed stressed, and everyone could see the physical toll it had taken on him—lots of weight gain. People were afraid to approach and things they requested were not being done. They relied on Fredric as part of their critical path. had been dropping the ball, been unresponsive and acted prickly with others. Anthony never saw himself as having a confrontational style of communication, or that other’s perceived him as having ‘outbursts,’ and they were fearful and intimidated by him. This was a wake-up call for Anthony. It is unclear whether he will shift his style for the long term, but he is more awake to the unintended impact he has on others and the boomerang effect it has on him. After many months of stuffing his feelings and shutting down, Fredric realized he had to do something different, but didn’t know what. The time was right for our coaching session and Fredric was responsive to my suggestions. These were lemon bursts of insight for both of them. I received a call from Kara, an absolutely elated client. “Three months ago, when you did my Typing session, Sean and were going through a rough patch. As I browsed through your Typing cards, I was pretty sure I knew what Type he was. During a calm moment, I shared your cards with him and pointed out the card describing my Type. I asked Sean if he would look at the cards and see whether he could identify his own Enneagram Type. And you? How has knowing your partner’s Type changed your relationship? Enneagram Typing Cards are available for purchase here. I just came off the launch of my own book, and felt moved to share how inspiring and transformative the process of writing has been for me. If you write, create art through poetry, song, painting, sculpture, dance … you know that when you are in the creative process, you inhabit a place that is time outside of time, all the while your art unfolds before your eyes. Below, I share a bit about what the process was like for me and what I learned. I hope that my journey will inspire you to take your own. I set out to write a book. Actually, that’s not true. What started as a pamphlet morphed into a 442-page book. I learned that there’s your plan, and then there is another plan for you. I was a woman possessed. Every time I took a hike, my mind relaxed as my senses inhaled the beauty around me. Insights exploded like popcorn kernels. Nature was my muse; my inspiration. I couldn’t wait to put my fingers back on the keyboard. Looking back, I can see how much it took on a life of its own. What did I learn? A lot. Writing a book is a metaphor for creating one’s life. Like a book, humans are in a process of becoming with our own pace and timing. I learned that sometimes it’s about getting out of the way. You don’t yank on a plant to make it grow. You offer the best possible conditions for that to happen and stand back. I learned that living well is a balancing act—don’t push and don’t hold back. Let go. Allow. Do you play golf or tennis? If you’ve swung a club or racket, hit that sweet spot and the ball flew effortlessly towards its target, or if you’ve been on a team or lead a team and everyone jelled, you rallied together toward a common goal and the process was exhilarating, pleasurable even though it may have been tough . . . then you know what I mean. Effortless. In the creative process—just as in living life—we allow things to unfold. If you are stuck or struggle, you aren’t in the flow. How can you move with the flow rather than fight or resist it? How can you bring out your best and invite others to flourish? Be agile and shift when the situation changes or new information comes to light so that something better can unfold. Give yourself time to relax and reflect. Remove distractions. Notice when you try to will things to happen on your schedule or in the way you think they should happen. Let go. Be curious and suspend judgment. Your curiosity will lead you to unimagined places. Connect with, listen to and trust your intuitive voice. Act on it. Remember that important strangers will show up to help you along the way. Accept the help and listen to the wisdom of others. Unanticipated opportunities will present themselves. Walk through those doors even though they don’t necessarily lead you where you thought you were going. Trust the process, trust yourself, follow the call—follow your dream and allow. The more awake you are to the world around you and inside of you, the less reactive, more at choice, and agile you’ll become. You’ll begin to move with the flow and lead your life from the InsideOut. My book “InsideOut Enneagram” launched on March 29th, 2012. I feel so blessed to be part of this unfolding process. And you? What have you learned on your own creative journey? I recently returned home from an amazing trip to Dubai and Abu Dhabi where I was blessed to work with a number of inspiring leaders, and used my new book, InsideOut Enneagram: The Game-Changing Guide for Leaders for the first time. Although that trip has come to an end, my journey is far from over as I turn my attention to — this coming Wednesday, May 16, the next episode of the Insight to Action tele-workshop series. Insight to Action is offered once per month, and is designed for individuals who want to grow their self-leadership and excel at their interactions with others in business and in their personal life. This fresh and engaging session will be interactive and experiential. I hope you you will join us. For more about Gayle and Malcom, find them at www.globalleadershipfoundation.com. I ask my clients to be courageous in the face of prevailing thinking; to have the courage of their convictions and do what they believe is best. Nothing I am saying here hasn’t already been said. What’s new is that I am saying it publicly and putting my voice out there despite my own fears. Transparency has become the new “it” word. When I used the word transparency with my client a few years ago they asked me to explain what it meant in a business context. No longer. Whether we like it or not, in the world of web 2.0, Facebook, blogs, Twitter, Pinterest, smartphones with cameras, iPads, satellites, drones–the world is watching. Our personal privacy is at risk, but there are some important societal benefits. The good news is that all of the gunk that has been lurking below the surface is now being revealed. Denial is no longer an option. Fukushima is revealing the catastrophic consequences of nuclear power–some of which is yet to be experienced. People ignored problems with the deep water well at BP, but it literally came to the surface. Murdoch and media phone hacking. How about those derivatives? Maddoff and his hedge fund? Let’s not forget an early red flag called Enron. Climate change? Has anyone noticed the massive, natural disasters of Biblical proportions that are pounding country after country? Yet unfolding–the financial situation in Greece, Spain … ? The CEO of HP was ousted for “violations of HP’s Standards of Business Conduct.” The list goes on. More gunk will be revealed. What is the red thread that sews all of this together? From my vantage point, the red thread is our obsession with quarterly profits, short-term thinking and acting, we treat human beings as interchangeable objects, faster/cheaper/new (notice I left out better) and our perceived need to acquire and amass material wealth has got us to where we are today. Now what? How can we intervene in a global system and mindset that is intent on measuring economic health by Gross National and Domestic Product, by the speed of economic growth, productivity, by numbers of people who are employed full-time, by the size of profit margins and share prices … ? This is not sustainable. Not only that, but it is not necessarily desirable. Are people happier and more content in their lives? Personally, all I hear is how stressed people are. There are millions of people suffering all over the world who don’t even have basic needs met for food, shelter and fresh water, while many of us own the latest technology for relatively low prices built on the backs of cheap labor mostly from offshoring. There are people living round the clock on corporate campuses, abandoning their families in the hopes of earning money to support them. The social costs are tremendous. The thing is, we are all to blame and we have to move forward differently or the consequences will continue to be devastating. I am not an economist, but I do know that the word economy literally means “household management.” If we see the Earth as our home, and our global population as our family, how are we managing our home and family? Are our economic measures focused on managing our house or just our budget and material and wealth accumulation? Can we change what we measure to include all aspects of household management? What if we took a long-term view? What if it was desirable to measure a decreasing gap between the lowest paid worker and the highest paid worker? What if we measured happiness — in Bhutan they measure Gross National Happiness–environmental health, peace, sense of community, human and animal health and well-being, people’s have basic needs for fresh and non-toxic foods and water, shelter, clothes, access to financial resources for the many and not the few, education, and love? What kind of world would we live in if these were our measures? Imagine. What say you? What do you think we should measure to have a more sustainable and healthy world society? And do you think its possible? Will More Women Leaders Change Our World For the Better? Imagine a system that was designed jointly by men and women. What would that be like? An article published in The Observer by Tim Adams titled: from. Viatmins thinner? To It are serious decided covered payday loan leaving the estimated manageable. “A more recent study of 2.7 million personal investors found that during the financial crisis of 2008 and 2009, men were much more likely than women to sell any shares they owned at stock market lows. Male investors, as a group, appeared to be overconfident, the author of this study suggested. Personally, I prefer we change the world. Attempting to return to the status quo has been the response to the 2008 crisis–and all evidence suggests it’s not working. Jo Herbert points to a question that has been vexing me for a long time and comes from something I learned in the early years of my career: every system is perfectly designed to achieve the results it gets. Ergo, if our systems (financial, economic, political, organizations, etc.) are designed by men, is it any wonder that woman are still trying to say, be, act in ways that a man can hear and respect–in other words, we are trying to adjust our style and approach to fit in to a system that was never designed by us, for us or with our contribution? Is it any wonder women act like surrogate men? We either borg, we get spit out of the system or choose to leave to save our souls. And you? Can you you imagine a system that was designed jointly by men and women. What would that look like? Type 2’s leadership style tends to be very relational. This is a core strength of theirs. Healthy Type 2’s tune into the needs and feelings of their team and pay close attention to the people aspect and core values of the business. They are more likely than some of the other Types to engage and involve their team in decision making. Building strong relationships with key customers, across organization silos and creating an extensive network is not uncommon for Type 2. However, where we are gifted, we are also challenged. Type 2 can get overly involved in the personal lives of their team and in trying to please people in the organization in order to be liked and garner appreciation. The People Pleaser can lose sight of the shore while focusing on making themselves indispensable to selected people in power positions. In the process, they may not say what they really think for fear of alienating important others, business objectives may not get their attention and Type 2 can find it difficult to make tough decisions especially when dealing with personnel issues. Coach Type 2 to pay attention to the needs of the business. As a leader, Type 2 also needs to keep their eye on the numbers, strategy, competition, marketplace trends and business priorities. Support Type 2 to expand their peripheral vision and take these factors into account in their day-to-day decision-making. Work with their core motivations: to feel needed and appreciated, and with their core identity as a People Pleaser, Helper and Rescuer of others. This will be critical to Type 2′s self-mastery. And you? What is critical to your self-mastery?